Happy Friday! If you're a regular visitor to my Blog, you know today's Bloggers Challenge Friday, but I've also got a treat in store for you today, just in time for Halloween. I'm stop 7 on the Paper Temptress Treasure Hunt. Have you been following the Treasure Hunt this week collecting your clues? If not, head back to the Paper Temptress Blog to find links to the other players blogs so you can collect your clue letters. Details on what you can win can be found here. This week we're celebrating Halloween on the Bloggers Challenge Group, I can't wait to see what the other players created! I used the Multi Step Pumpkins from Kitchen Sink Stamps, stamping on White card stock as follows: #1 Memento Potters Clay stamp off, #2 Memento Potters Clay stamp off, #3 Memento Rich Cocoa stamp off, #4 Memento Potters Clay, #5 Memento Potters Clay 2 x's. Stem - #2 Memento Cottage Ivy, #1 Memento Potters Clay. I masked the larger pumpkin, then stamped the two smaller pumpkins in the same order. I then masked the two smaller ones (keep large one masked) and stamp the vine as follows: #4 Memento Cottage Ivy, #3 Memento Cottage Ivy, #2 Memento Cottage Ivy stamp off, #1 Memento Cottage Ivy stamp off. Remove all masks stamp face as follows: #2 Memento Black, #1 Memento Potters Clay. Next week we're getting ready for the Holidays at Kitchen Sink Stamps, so be sure to check back, want to do a little shopping - use code LISA10KSS to save 10% on all your Kitchen Sink Stamps purchases. To add some color under my image I used a few panels of Basic Grey Eerie Pattern Paper, layering onto Hot Fudge Pop Tones panels. I added a bit of Drywall Stitching to the both panels, the top one in Chocolate, the bottom panel with a White Gel Pen. I layered these panels onto some beautiful Copper Ore Glimmer card stock, using SCS Sketch 251 as my inspiration. Thanks for stopping by, don't forget to click on the Bloggers Challenge logo on my sidebar to see what the other challenge players created this week. The clue you seek for the Paper Temptress Treasure Hunt is C. Be sure to check back tomorrow for a non fattening Halloween Treat! Have a great weekend! I have to tell you I have become a HUGE fan of the Kitchen sink stamps HUGE FAN!! All you have to do is take one look at those pumpkins and you can tell why. They look so life like, almost like printed stickers or a photo instead of a rubber stamp in markers!! I am so happy that you have joined PaperTemptress's design team so welcome aboard!! These are some scary looking pumpkins! Great Halloween card!! These pumpkins are so beautiful, just the perfect card! Beautiful and inspiring card. Love the layout and the colors. Congrats on being on the Paper Temptress DT. Awesome card Lisa. 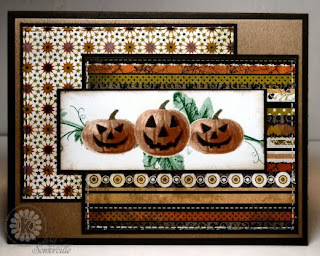 Love the Jack-o-lanterns (they look fantastic) and paired with the divine BG Eerie DP you have a great looking card. Well congrats on joiniing the Paper Temptress design team, I don't know how it keep it all straight GF. I always enjoy seeing your fab Art!!! I am a TJ and I visit your blog frequently. Your pumpkin card is sooo neat. I love those backgound print papers and the way you layered them on Paper Temptress card stock. You could teach me a lot about masking. Great card, those pumpkins look so real! Nice job on this card. I love the mix of papers here! You are rockin these stamps girl! They are so real to life. Beautiful work Lisa! Great card. I still can't get over how real these pumpkins look! Love your card- it is so amazing those stamps look so life like or real! I love the Dp you used too. TFS! You've made me a big fan of Kitchen Sink stamps too! After seeing your gorgeous cards and so very realistic coloring I just had to try them out myself. The papers you use are awesome and really set the tone of the cards you make. Super cute card!!! Love those pumpkins!! I swear that those stinkin stamps look just like you used stickers or pictures. Great job. Love it. Simply gorgeous! The rich tones are perfect for the Halloween theme. Love it! Those are fantastic pumpkins Lisa---they are so real!!! Love your card--what a great time of year this is! What a great card this is! Like so many others, you've sold me on this stamp line and my first set just landed in my mailbox today. Thanks...I think! Awesome, Lisa! Love the pumpkin images...they look so real! saying no to more stamps...you are such an enabler..Beautiful piece Lisa..I am a Basic Grey Errie Fan..used that on my challenge also. That is a fabulous card! I love that image...those KS stamps are just beautiful!! !